Not a Drop to Drink: H. R. Downs worries that a government report stating that the American West will be out of water in 2025 is all too true. It's possible to live without a lot of things, but there's absolutely no substitute for water, says Penngrove resident H. R. Downs. "For both gasoline and electricity, there are plenty of alternatives. You can walk, you can ride a bicycle, you can ride a horse, you can get there by many other means other than an automobile. If the electricity goes out, you can read a book by a candle, you can do all kinds of stuff. There is no alternative to water." As president of the OWL Foundation (Open Space, Water Resource Protection and Land Use), Downs would like to see tough government policies and a thorough regional groundwater-management plan to protect both existing water-scarce areas and water-rich districts that are currently being overused. Sitting recently in a Cotati cafe, Downs talks quietly but intensely, his brown eyes flashing behind his oversized, gray-framed glasses as his fingers dance across his laptop keyboard, bringing up charts and graphs to illustrate his message. "We're all in the same boat, to use a water metaphor," Downs says. "We have to start coordinating the cumulative impacts of our water supply. This is a huge problem." Most people take H²0 for granted, he adds. "We are made of water. It's something that people don't really understand. They don't see water because we are water and it's too obvious. It's the kind of thing that just doesn't occur to you." And unfortunately, Downs adds, most people don't grasp that this planet doesn't produce an unlimited supply of this precious liquid. Fresh drinking water is simply dirty water recycled naturally within a closed system. "We have the same amount of water today that we had 20,000 years ago. Nature doesn't make new water. There's only a certain amount available." OWL was founded a few years ago when like-minded individuals attended meetings to create a water-resource element for Sonoma County's general plan. The group's eight-member board of directors includes a geologist, a hydrologist and other experts. In February, OWL filed suit charging that Rohnert Park's 2005 water-supply assessment report didn't satisfy a new state law requiring proof that there's enough water available before allowing any new development equivalent to 500 homes or more. In June a judge agreed, ruling that Rohnert Park has to look at its entire water basin, not just within its city limits. "This is a historic ruling," Downs says. "This is an important law and it will affect the entire state of California." He is not anti-development. "If you've got water, then you can do whatever you want to." But Downs believes Rohnert Park and other local government officials aren't willing to admit the extent of this area's water problem. There are 160 places in California that have created official groundwater management plans, as laid out in the state water code, but the Sonoma County Board of Supervisors declined to do this, Downs says. "Bottom line, the goal is a comprehensive water resource management plan. Not just groundwater. It has to be all the groundwater basins and sub-basins; all the surface water sources such as the Russian River; all the well owners; all the cities and water districts; all the [agencies, including those in Marin, that get water from] the Sonoma County Water Agency; everything has to be coordinated." Downs and his wife started coming to Sonoma County in 1984, and moved here from Berkeley in 1990. After a career that included being general manager of a factory, working for UNICEF in Asia for some 14 years, laboring for 10 years as a ghost writer and doing a stint as a photographer, Downs planned to retire to Penngrove and, as a self-described "inveterate bibliophile," spend time with his books. Instead, he became intrigued by a lawsuit that a group of Penngrove well owners had filed against the city of Rohnert Park. "I discovered, much to my shock and horror, that Rohnert Park had pumped so much water in the previous 25 years, they had dropped the water table 150 feet. That is a massive, massive drop. To put this in perspective, Rohnert Park sits in the Santa Rosa plain. The Santa Rosa plain is made up of a lot of sandy soil and it's probably the most water-rich area in the whole county. So they threw that into overdraft. That's quite impressive." 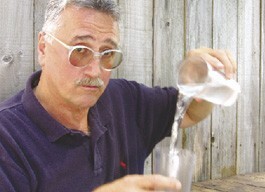 His "retirement" is spent working for OWL, trying to raise awareness about the precious nature of local water resources. Downs' years of living in Asia provide a special perspective. "I had an opportunity to see what happens when you don't have enough water, or what happens when the water that you do have is seriously polluted. It's endemic in Asia." In 2004, a report by the federal Department of the Interior (www.doi.gov/water2025) warned that the American West will run out of water by 2025. Downs hopes the North Bay will pay attention before things get that bad. "We're going to hit the wall with this and from what I've seen in other parts of the world, we don't want to do that. We can avoid it. We can plan ahead."